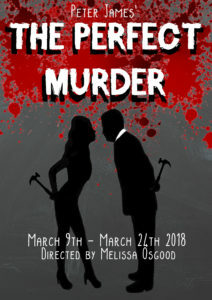 THE PERFECT MURDER, a highly entertaining dark comedy, written by Peter James and directed by Melissa Osgood, might just leave you sleeping with one eye open! AUDITIONS- Sunday, December 10th at 1pm @ 16th Avenue Theatre- Green room. Ring Melissa Osgood for expressions of interest or to get an audition pack- Ph:021 288 7828 or email melissaosgood@gmail.com for more info or PM us. VICTOR SMILEY (M-40-50’s) an unhappily married grump, stuck in his ways, but wants things how they used to be. JOAN SMILEY (F-40-50’s) Victors wife, who has been loyal but is fed up with his brooding and unpleasant nature, she wants more from her life. KAMILA WALCAK (F-20’s) (Croatian or similar accent) Victor’s secret muse who works as a prostitute at the Kitten Parlour. DETECTIVE CONSTABLE ROY GRACE (M-30’s) Well put together, mild mannered and handsome officer who is very good at his job. DON KIRK (M-late 20-30’s) A strong, strapping man who isn’t very clever and adores Joan Smiley. An audition pack will be available once registered to audition.